This is a very realistic recording of a summer thunderstorm. The recording features booming thunder, periodic wind gusts, and rain that varies in its intensity. As you should expect, the sound volume level is not constant. If you crank the volume, the thunder booms will shake the room. The sound quality is fantastic. 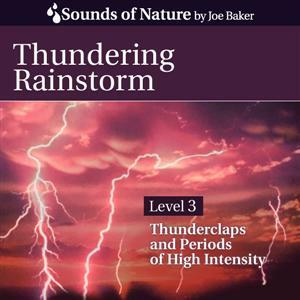 This is the “Level 3” recording in the four part rain series by “The Sounds of Nature” (by Joe Baker). Level 1 is constant, steady rain, Level 2 has distant thunder and rain variation, and Level 4 is a torrential rainstorm, with hurricane winds. If you like sleeping through thunderstorms, you should like this recording. If you need something gentler, try our Level 2 offering, “The Sound of a Summer Rain.” This album contains only one track that is 73 minutes in length. Number 1 top seller on Amazonmp3.com in new age/environmental category (March-2009).